The CleanFinancial.com guide to spread betting on the German stock market. Where Can I Spread Bet on the DAX 30? Where Can I Trade the DAX 30 for Free? Where Can I Practice Trading the DAX 30? The DAX 30 is also known as the "Germany 30", "Xetra DAX" and "DE 30"
The MDAX is also known as the "Germany 50", "Germany Mid-50", "Germany MCap"
For more details see About the German Stock Market below. Where Can I Spread Bet on the German Stock Market? You might be able to financial spread bet on these markets through other providers. The German DAX 30 is currently trading at 11,917.3. At the end of the last session, the market closed down -374.2pts (-3.05%) at 11,884.3. The stock market index is currently higher than the 20-period MA of 11,910.7 and lower than the 50-period MA of 12,025.1. The index is lower than the 20-DMA of 12,206.9 and lower than the 50-DMA of 12,442.2. The German DAX 30 is currently trading at 12,953.0. In the last session, the market closed up 8.0pts (0.06%) at 12,961.2. The market is above the 20-day MA of 12,751.5 and above the 50-day MA of 12,430.3. (And it's not just the FTSE 100, if you look closely then the DAX is looking precarious too). 24-Aug-15 [3:40pm] Will the Dow and DAX See Bounces Tomorrow? Here's a quick look at Tuesday. 20-Aug-15 [12:26pm] FTSE 100 Heading to 6,000? The DAX has given up half of this year's gains and the chart is showing a potential Death Cross for the German market. Skip to 3mins for the FTSE 100. The chart for the UK market continues to look bearish and there has been a strong break lower. But plenty still to come from Greece. Below, a 16 minute technical look at the markets. Also, skip to 3m30s for a technical look at EUR/USD. » For more see Stock Market Trading News & Analysis. Where Can I Find Live Prices and Charts for the DAX 30? The live CFDs chart and prices below default to the DAX 30 (Germany 30) and will give you a helpful guide to the German stock market. For a live MDAX chart, just search for 'Germany MCap'. You can also access live charts and prices for individual German shares e.g. just search for Allianz, BMW, Lufthansa, SAP, Siemens etc. The above Plus 500 chart is usually based on the DAX 30 futures price (not the spot market). If you would like to look at live spread betting charts and the current prices for the DAX 30, you'll probably need a spread betting account. Also, a spreads account lets you access the shorter term daily markets. Users should note that all spreads accounts are subject to credit and status checks. Should your application be approved then, after logging in, you will be able to see the prices and live charts. These are usually provided for free, however, the catch is that you'll probably receive an occasional sales call or letter from the relevant spread trading company. If you decide to trade then, before you start, you should note that financial spread betting and CFDs do involve a significant level of risk to your capital. An array of time periods - 1 minute, 30 minutes, 1 hour, 2 hours etc. Useful technical overlays - Ichimoku Clouds, EMA, Wilder's Smoothing etc. Over 30 indicator charts - MACD, Relative Volatility, Linear Regression, TRIX, CCI etc. Advert: German Stock Market Spread Betting, sponsored by FinancialSpreads.com. You can spread bet on the DAX 30 with Financial Spreads. Where Can I Spread Bet on the DAX 30 for Free? Investing always includes a degree of risk, but if you would like to try a Test Account (free), where you can try out spread betting and access charts, please see below for more details. When thinking about which investment option is right for you, don't forget that in the UK, spread betting is currently exempt from income tax, capital gains tax and stamp duty*. Each of the companies listed above currently provide a risk free Demo Account which lets users try out trading theories, practice with an array of trading orders and use charts, including candlestick and bar charts. For more details on a particular German company, simply click on the firm you're interested in below. As well as live charts and prices for each firm, we talk you through the most popular spread betting questions e.g. Where can I spread bet? Where can I trade commission free? How to Spread Bet on the DAX 30? As with many markets, you can speculate on indices, such as the DAX 30, to rise or fall. When financial spread betting on the DAX 30 index you trade in £x per point. Therefore, if you decided to invest £2 per point and the DAX 30 moves 31 points then that would be a difference to your P&L of £62. £2 per point x 31 points = £62. One important thing to note is that this is a 'Rolling Daily Market' and therefore unlike a normal spread betting futures market, there is no settlement date. If you leave your position open at the end of the day, it just rolls over to the next trading session. You can find more on Rolling Daily Markets, as well as a fully worked example, in our guide to 'Rolling Daily' markets. Then you may choose to buy a spread bet at 7303.3 for a stake of, for example, £3 per point. This means that you make a profit of £3 for every point that the DAX 30 index pushes above 7303.3. Having said that, such a bet also means that you will lose £3 for every point that the DAX 30 market falls below 7303.3. Put another way, if you buy a spread bet then your P&L is worked out by taking the difference between the closing price of the market and the price you bought the spread at. You then multiply that difference in price by your stake. As a result, if after a few sessions the market rose then you might consider closing your spread bet so that you can secure your profit. Speculating on stock market indices, whether by spread betting or otherwise, is not easy. In this case, you had bet that the index would increase. However, it can also decrease. If, contrary to your expectations, the German stock market fell, then you might choose to close your position in order to restrict your losses. Note - DAX 30 Rolling Daily spread correct as of 23-Nov-12. Whilst spread betting on the Germany 30 index you trade in £x per point. So, if your stake was £5 per point and the Germany 30 moves 27 points then that would change your P&L by £135. £5 per point x 27 points = £135. Then you might decide to go long of the market at 7295.3 for a stake of £3 per point. So, you win £3 for every point that the Germany 30 index increases above 7295.3. Nevertheless, you will lose £3 for every point that the Germany 30 market falls lower than 7295.3. Thinking of this in a slightly different way, if you were to ‘Buy’ a spread bet then your P&L is worked out by taking the difference between the settlement price of the market and the initial price you bought the spread at. You then multiply that price difference by your stake. As a result, if after a few hours the German stock market rose then you might consider closing your spread bet so that you can secure your profit. Financial spread trading is not straightforward. In this example, you wanted the German index to go up. However, the index might decrease. If the Germany 30 market fell then you could choose to close your spread bet to limit your losses. Note: Germany 30 Rolling Daily spread accurate as of 23-Oct-12. On the expiry date for this 'March' market, 15-Mar-13. As with the DAX 30 daily market, you speculate on the DAX futures contract in £x per point. So, if your stake was £4 per point and the DAX moves 38 points then that would alter your P&L by £152. £4 per point x 38 points = £152. Then you may choose to buy at 7321.3 and trade, for the sake of argument, £4 per point. With this contract, you gain £4 for every point that the DAX moves higher than 7321.3. Having said that, such a contract also means that you will lose £4 for every point that the DAX market goes below 7321.3. Looked at another way, with futures spread trading your P&L is calculated by taking the difference between the price the market expires at and the price you bought the market at. You then multiply that difference in price by your stake. Stock market futures trading doesn't always work out. With this futures contract, you thought the index would go up. Nevertheless, the German stock market might have fallen. 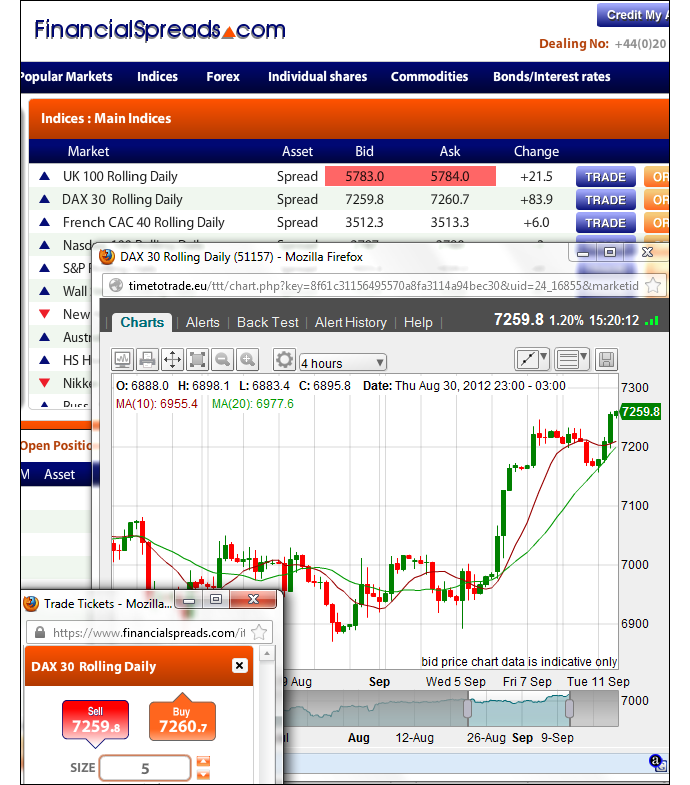 If the DAX decreased and settled lower at 7292.0, you would end up making a loss on this spread bet. Note: DAX March Futures quoted as of 27-Sep-12. How to Spread Bet on the MDAX? Unlike the DAX 30 which you can trade using rolling daily / spot markets, the MDAX often comes as a futures market. On the expiry date for this 'December' market, 21-Dec-12. Whilst financial spread trading on the MDAX index you trade in £x per point. Therefore, should you decide to invest £4 per point and the MDAX moves 22 points then that would make a difference to your profit/loss of £88. £4 per point x 22 points = £88. Then you may decide that you want to go long of the market at 11029 and risk £2 per point. With such a bet you make a profit of £2 for every point that the MDAX index rises above 11029. On the other hand, such a bet also means you will lose £2 for every point that the MDAX market falls below 11029. Put another way, should you ‘Buy’ a spread bet then your profit/loss is worked out by taking the difference between the settlement price of the market and the initial price you bought the market at. You then multiply that difference in price by the stake. Trading indices, whether by spread betting or not, can work against you. With this example, you had bet that the index would go up. Nevertheless, the index can also fall. If the German Mid-Cap index had fallen and settled at 10960, then you would end up making a loss on this market. MDAX December Futures index market correct as of 26-Sep-12. If you spread bet on a futures market you do not have to wait for the expiry date for your trade to close. Like the rolling daily example above, you can close the trade yourself e.g. to lock in a profitable trade or to limit a loss making trade. How to Spread Bet on DAX 30? Should an investor decide to invest in companies such as Deutsche Bank then one solution is a spread bet on the Deutsche Bank share price. When spread betting on German equities you trade in £x per cent. So, if you risked £3 per cent and the Deutsche Bank share price moves €0.37 then that would make a difference to your profit/loss of £111. £3 per cent x €0.37 = £111. You are also able to invest in this market in Dollars or Euros, e.g. $x per cent. An important aspect of this Rolling Daily Market is that in contrast with futures markets, there is no closing date. You do not have to close your trade, should it still be open at the end of the trading day, it just rolls over into the next session. Then you might buy a spread bet at €33.04 and invest £5 per cent. With such a spread bet you make a profit of £5 for every cent that the Deutsche Bank shares increase and go higher than €33.04. Having said that, you will make a loss of £5 for every cent that the Deutsche Bank market falls below €33.04. Considering this from another angle, if you buy a spread bet then your P&L is worked out by taking the difference between the settlement price of the market and the initial price you bought the market at. You then multiply that difference in price by the stake. Financial spread trading is not always simple. In this case, you wanted the share price to increase. However, the share price might decrease. If the Deutsche Bank share price had started to drop then you might decide to settle/close your spread bet in order to limit your losses. Note: Deutsche Bank Rolling Daily market accurate as of 18-Dec-12. The German stock market is based in Frankfurt and 'DAX' stands for Deutscher Aktien IndeX (German stock index). The DAX 30 is an index of 30 major German companies which is calculated by Deutsche Börse on their Xetra trading system. The companies have to be listed on the Frankfurt Stock Exchange and are the 30 largest companies in terms of order book volume and market capitalization. 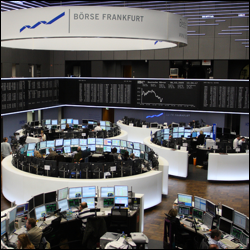 In spread betting and CFD trading, the DAX 30 is often one of the most popular markets and is also known as the "Germany 30", "Xetra DAX" and "DE 30". The MDAX 50 is an index of the next 50 largest German companies in terms of order book volume and market capitalization. Again, with spread bets and CFDs, the MDAX is also known as the "Germany 50", "Germany MCap" and "Germany Mid-50". Below, an older but still useful case study on the German stock market by Shai Heffetz, InterTrader, 29-June-2011. The DAX 30 is an index reflecting price movements of the 30 biggest companies in terms of market capitalisation and order book volume on the Frankfurt Stock Exchange. The index was published for the first time on 30 December 1987 with a base value of 1000. 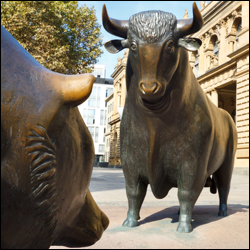 More recently, the DAX 30 spread betting market had seen a strong bull run since the beginning of September last year, however, this started to lose momentum during the middle of February this year. In fact, between mid-February and mid-March 2011, we saw a substantial price correction. The price started recovering on the 17th of March and, as can be seen in the chart below, it broke upwards through the Ichimoku cloud on the 20 April. It went on to make a brief high of 7601.50 on the 2 May before starting to lose steam again. On the 2 June, it closed at 7096.80, a level that was significant because the price moved into the green Ichimoku cloud on that day. During the rest of June, the price hasn’t left the cloud and so is clearly indicating a directionless market. Currently, the price has remained locked inside the cloud. The blue Kijun Sen and the red Tenkan Sen lines are running together, with the green Chinkou Span line virtually touching the price 26 periods ago. All this further strengthens the indices technical analysis view of a non-trending market. A cautious trader will wait for the market to provide him with a clear signal before going long or short. In this case, the cloud should be a good indicator. If the price breaks upwards through the cloud a long position might be worthwhile; if it breaks out downwards, new lows might be on the cards and a short position will be a better option. Below, an older but still useful case study on the German futures market by Shai Heffetz, InterTrader, 21-Sep-2011. Looking at the chart below from a technical point of view, it is clear that the DAX 30 is currently in a strong bear phase. On a fundamental level, this makes sense: France and Germany are heavily exposed to Greek government debt, something that has already caused the credit rating of two major French banks to be downgraded. Since the beginning of August, renewed fears of a Greek default has wreaked havoc on French share markets. The DAX dipped decisively below the Ichimoku Kinko Hyo cloud on 1 August 2011, reaching 6891.30 at one stage before it closed at 6969.70. After that, it was only bad news. On 12 September, the price briefly touched a low of 4963.80 before closing at 5145.20. Billions of Euros were wiped off investor’s balance sheets in the process. The Greek ghost has not disappeared yet: emergency talks are the order of the day and although the DAX has recovered somewhat during the last few days, it is still far below the Ichimoku cloud. The green Chinkou Span line is also still far below the price of 26 periods ago. According to the technical analysis theory, this confirms that we have not seen the end of the bear run yet. If the Greek debt issue is resolved (at least for the present), we will most likely see an upsurge in the DAX Rolling Daily and DAX Futures markets, although it is still a long way before the price will emerge upwards from the Ichimoku cloud again, nearly a thousand points at this stage. This is where spread betting traders might start looking at buying medium-term trades again. If the price drops below the red Tenkan Sen line in the near future, it might be a good time for short trades, since it could be the signal that we will soon see new lows. We have stock market updates and analysis throughout the day. Our stock market guide also has live prices, charts, a spread betting comparison, tips on where to trade commission-free, tax-free* and... » read guide. A look at popular stock market trading accounts, commission free accounts, charts, a price comparison, how to buy/sell a stock market index, regular analysis and... » read guide. FTSE 100 financial spread betting guide with a price comparison and daily analysis. Plus live FTSE 100 charts & prices, where to spread bet on the stock market index commission-free and... » read guide. Dow Jones financial spread betting guide with a price comparison and daily analysis. Plus live Dow Jones charts & prices, where to spread bet on the stock market index commission-free and... » read guide. S&P 500 financial spread betting guide with a price comparison and daily analysis. Plus live S&P 500 charts & prices, where to spread bet on the stock market index commission-free and... » read guide. Nasdaq 100 financial spread betting guide with a price comparison and daily analysis. Plus live Nasdaq 100 charts & prices, where to spread bet on the stock market index commission-free and... » read guide. Nikkei 225 financial spread betting guide with daily analysis. Plus live Nikkei 225 charts & prices, where to spread bet on the stock market index commission-free and tax-free* as well as... » read guide. Hang Seng financial spread betting guide with daily updates. Plus live Hang Seng charts & prices, where to spread bet on the stock market index commission-free and tax-free* as well as... » read guide. German stock market spread betting guide with a price comparison, daily analysis, live charts & prices for the DAX 30, MDAX and German shares. Plus where to spread bet on the Frankfurt stock market commission-free and... » read from top.